456 pages | 64 B/W Illus. Chronic Obstructive Pulmonary Disease Exacerbations covers the definition, diagnosis, epidemiology, mechanisms, and treatment associated with COPD exacerbations. This text also addresses imaging and how it plays a pivotal role in the diagnosis and study of exacerbations. JADWIGA A. WEDZICHA is Professor of Respiratory Medicine at the University College London and Honorary Consultant Physician, Royal Free Hospital NHS Trust, London, UK. She received her M.D. from the University of London, London, UK. 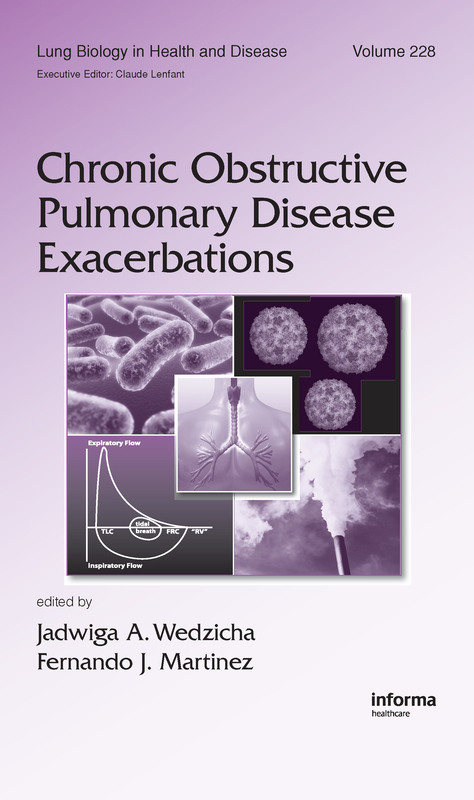 Dr. Wedzicha has a major interest in the causes, mechanisms, and impact of COPD exacerbations and has published extensively on this topic. She also is an expert on home oxygen therapy and non-invasive ventilation in COPD patients. Dr. Wedzicha has chaired the British Thoracic Society (BTS) working group on home oxygen therapy, is currently chairing the BTS Home Oxygen Guidelines Group, and is a member of the Department of Health’s External Stakeholders Advisory Group for the Home Oxygen Service. She was a member of the Guideline Development Group for the NICE COPD guidelines and the External Reference Group (ERG) of the COPD National Service Framework (NSF). Dr. Wedzicha directs an active internationally recognized research group into aspects of COPD exacerbations with major grant funding. She is currently Editor-in-Chief of the respiratory journal Thorax, a member of the British Medical Journal advisory board, and an editorial board member for a number of international journals. FERNANDO J. MARTINEZ is Medical Director of Pulmonary Diagnostic Services; Pulmonary Director of the Cough/Dyspnea Clinic; Associate Director of Bronchoscopy Service; Director of the Lung Volume Reduction Program; Professor of Pulmonary and Critical Care Medicine; and Co-Medical Director of the Lung Transplantation Program, the University of Michigan Health System, Ann Arbor, Michigan, USA. Dr. Martinez received his M.D. from the University of Florida School of Medicine, Gainesville, Florida, USA. From 2002 to the present, he has been named on both the national and Midwest "Best Doctors in America" lists, in addition to "Metro Detroit’s Best Doctors" list. Dr. Martinez is an active member of several professional organizations, including the American College of Chest Physicians, the American Thoracic Society, and the American Association of Cardiovascular and Pulmonary Rehabilitation. He is Associate Editor of the American Journal of Respiratory and Critical Care Medicine, and he serves on the editorial and review boards of several other journal publications. Dr. Martinez is an accomplished author/contributor and invited lecturer, and has received numerous grants to research respiratory health and disease.